You'll know Durham has become a real city when German food returns -- a trend that started in NY about five years ago (Neue Museum, Brooklyn biergartens, schmancy Austrian cuisine in Manhattan). Those car wreck photos crack me up! The Paschall’s Bakery building was erected in 1924 on the southwest corner of Duke and Morgan Streets (119-121 Duke Street). 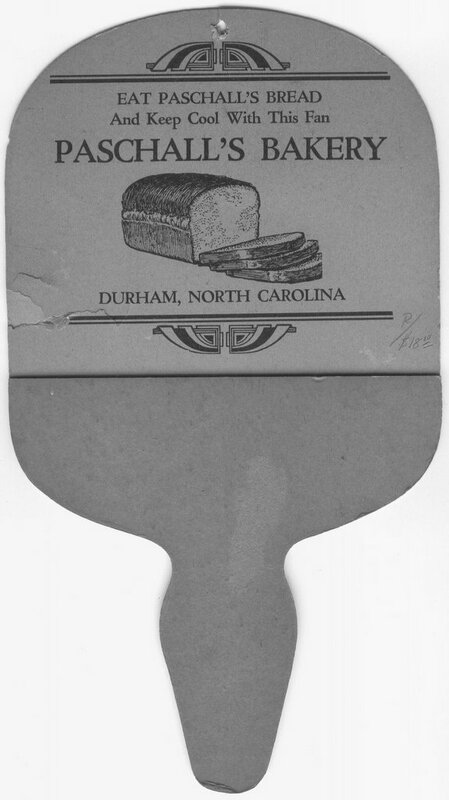 Owned and operated by Mallie J. and Louise W. Paschall, Paschall’s Bakery was a descendant of Mallie’s first bakery, the Star Bakery, which was located at 238 W. Main from 1913-14 and at117 E. Chapel Hill Street from 1915-1920. 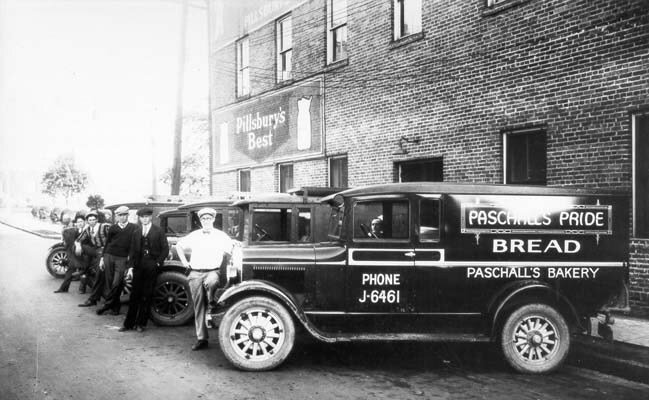 Paschall’s Bakery remained in business until 1943. Listed primarily as a wholesale bakery in the Sanborn maps, the lot also included a warehouse on the Norfolk & Southern Railroad right-of-way that has since been removed. 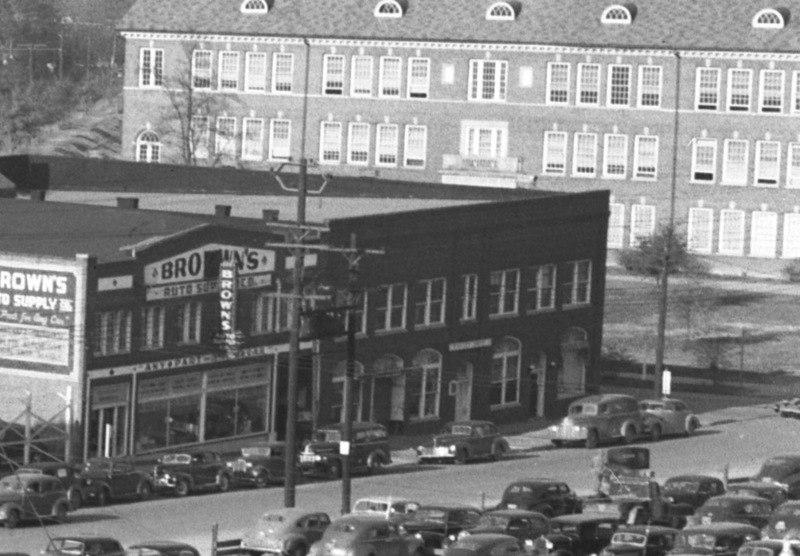 The Paschall’s sold their building in 1943 to James Marcellus Mathes (1887-1972). Mathes was a native of Durham and the founder of J. M. Mathes Wholesale Company, a tobacco wholesaler. He used the building until his death in 1972. Mallie J. Paschall passed away in April 1961, with his wife, Louise, following less than two months later. I seem to remember a "Goodnights" type comedy club after the Weeping Radish... and I do recall a sign with a Mardi Gras mask on it (I think). Durham actually has two places Where Restaurants Go to Die -- Duke and Morgan and Roxboro and Fairfield (once home to Darryl's, Spaghetti Freddy's, Ole NC Bar-B-Cue, and Rhino (? or some other pachyderm). It now houses, Ole NC -- again -- which appears to be doing well at the moment. Thanks so much for the additional info - I've updated the post to reflect this. mmmm... Hav-a-Tampa. I grew up within smelling distance of their cigar rolling plant. They marketed themselves as "The World's Largest Indoor Insane Asylum." Beat THAT, Playground! 1996 Steve and Clark's Brew Pub and Sausage Co. The Playground and Grill never opened? The Playground opened for about a week or so. Actually, I've seen German restaurants elsewhere (Gordon Biersch in Atlanta). It seems like a cool idea. I know if Atlanta (a city with either 100 dollar plates or Applebee's and just a few cool places in between) can do it, we can. I'm not vegetarian or vegan, but I think it would be a good addition to the city with a growing vegi/vegan population. I don't think it should be here, though. I went to it when it was the French Quarter, and I think that might have been the high point of the food there. It was Tobacco Roadhouse for at least 3-4 years, where it had some success as a music venue, but never could keep that up. The Playground did indeed open -- for one night. From what Joanne Fitzgibon of the late lamented Joe and Jo's told me, all local establishments get to see a report when the liquor license goes up for approval. Most restaurant owners, she said, have rap sheets, from serving alcohol to minors and other violations, but for the owners of the Playground, it was like a small novel. As such, I think ALE decided to keep a close eye on it, and decided to pay an unannounced visit on opening night. Sure enough, all the liquor bottles behind the shelf were bought at "off sale" prices, meaning they weren't marked or taxed for liquor by the drink. ALE shut them down that very night, and they never re-opened. an old business partner and i actually met with maverick several times about turning this space into a restaurant. ogilvy was keen on the idea of having a place to eat and drink close by. but the price per square foot was exceptionally high for this area, so we didn't get beyond talking. with the right concept, that location could work as a restaurant. i can't wait to see what it becomes. Love the car wreck pics ! Would really like to see pictures of all the area car dealers through the years ! Yes , I'm an old car nut ! My great-great grandfather was J.M. Mathes. Thank you for this website and for giving me a glimpse into my family history. Actually J M Mathes Co. was owned and operated by the Yarboroughs and Watkins in Durham and R M Geddie in Fayetteville. To my knowledge they owned it in the mid 50's up to the deaths of all the owners. Mr. Watkins being the first due to a tragic accident. My mother worked for this company for 30 years up until the death of R M Geddie in the mid 1980's. I never heard her once speak of knowing a J M Mathes, so his ownership must have taken place prior to 1956 when she went to work for them. I worked as a stock boy at the JM Mathes Company in the summer of 1969. It was owned by the Yarboroughs and the Watkins, not JM Mathes. My uncle Byers Watkins died in an accident in 1965 and his son Warren Watkins was also involved in the business. Although was young and naive, it was clear Mr. Yarborough ran the business. One of Mr. Yarborough's sons, Stuart also worked there that summer before going on to play basketball at Duke. 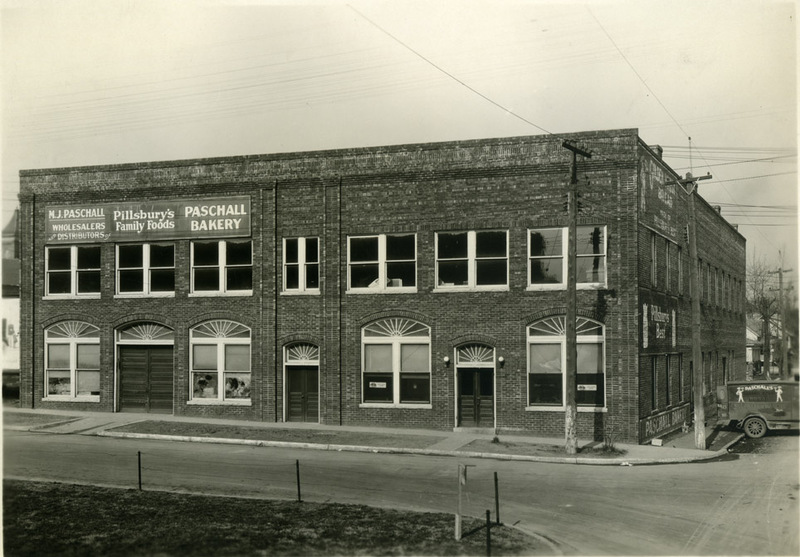 The Paschall’s Bakery building was erected in 1924 on the southwest corner of Duke and Morgan Streets (119-121 Duke Street). Owned and operated by Mallie J. and Louise W. Paschall, Paschall’s Bakery was a descendant of Mallie’s first bakery, the Star Bakery, which was located at 238 W. Main from 1913-14 and at117 E. Chapel Hill Street from 1915-1920. Paschall’s Bakery remained in business until 1943. It appears that they were primarily a distributor, but also must have had some walk-in/direct business as well to give away advertising. But a stable of delivery trucks along Morgan St. seems to have been commonplace. Below, a brief look at the side of the bakery in the background as some kids walk to school at Durham High, 1937. The Paschalls sold their building in 1943 to James Marcellus Mathes (1887-1972). Mathes was a native of Durham and the founder of J. M. Mathes Wholesale Company, a tobacco wholesaler. Aerial shot, looking northwest, 1948. But by 1957, it has been supplanted by J.M. Mathes wholesalers, which appears to have sold beverages and cigars, at least. Yes, a car wreck, but the JM Mathes company in the background - looking southwest, 12.05.57. By the late 1980s, though, the first in a series of ill-fated restaurant ventures would begin here. The first, the Weeping Radish, was actually the most successful - Durham's first brewpub, with impressive beer-making equipment behind glass walls; it was actually a fairly popular place during the late 1980s and early 1990s. I'm assuming that it was their renovation that took off the back of the building, leaving a 'ruin-esque' wall along Morgan St. Soon, this would become The Place Where Restaurants Go to Die. Weeping Radish closed, and was followed by Old Heidelberg Village/Charlie Goodnight's. I think Steve and Clark's came next. I seem to remember another restaurant - maybe with Mardi Gras in the name? Yancey's, once successful at City Market in Raleigh, would make a big entrance to Durham in this spot - and lasted for about 3 months. A sign soon went up for "The Playground" - a restaurant that never actually got beyond putting up a sign. The folks at Maverick Real Estate seem to have had the right idea when they bought the building - avoid restaurants. They've renovated the building for office space, and it appears to still be for lease. This building was heavily damaged by an explosion on April 10, 2019 which destroyed the adjacent Studebaker Building. 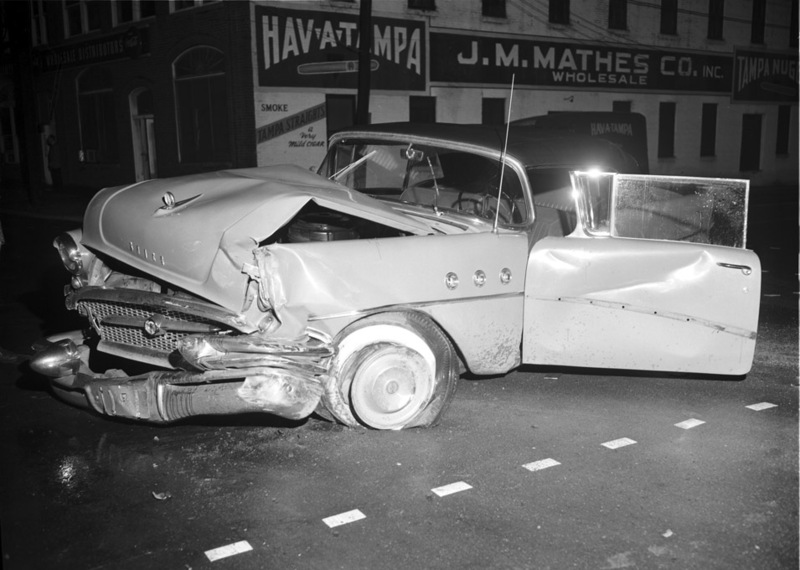 Love the car wreck pics ! My great-great grandfather was J.M.